Mauritania (Arabic: موريتانيا <--موريتانية is the Arabic form for Mauritanis'a nationality--> Mūrītāniyya'a), officially the Islamic Republic of Mauritania, is a country in northwest Africa. It is bordered by the Atlantic Ocean on the west, by Senegal on the south-west, by Mali on the east and south-east, by Algeria on the north-east, and by Moroccan- annexed territory of Western Sahara on the north-west. It is named after the ancient Berber kingdom of Mauretania. 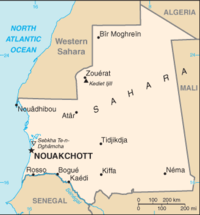 The capital and largest city is Nouakchott, located on the Atlantic coast. From the 5th to 7th centuries, the migration of Berber tribes from North Africa displaced the Bafours, the original inhabitants of present-day Mauritania and the ancestors of the Soninke. The Bafours were primarily agriculturalist, and among the first Saharan people to abandon their historically nomadic lifestyle. With the gradual desiccation of the Sahara, they headed south. Following them came a migration of not only Central Saharans into West Africa, but in 1076, Islamic warrior monks ( Almoravid or Al Murabitun) attacked and conquered the ancient Ghana Empire. Over the next 500 years, Arabs overcame fierce resistance from the local population (Berber and non-Berber alike) and came to dominate Mauritania. The Mauritanian Thirty-Year War (1644-74) was the unsuccessful final effort to repel the Yemeni Maqil Arab invaders led by the Beni Hassan tribe. The descendants of the Beni Hassan warriors became the upper stratum of Moorish society. Berbers retained influence by producing the majority of the region's Marabouts—those who preserve and teach Islamic tradition. Many of the Berber tribes claimed Yemeni (and sometimes other Arab) origin: there is little evidence to suggest this, though some studies do make a connection between the two. Hassaniya, a mainly oral, Berber-influenced Arabic dialect that derives its name from the Yemeni Beni Hassan tribe, became the dominant language among the largely nomadic population. Moors reacted to this change by increasing pressure to Arabize many aspects of Mauritanian life, such as law and language. A schism developed between those—mainly Moors—who consider Mauritania to be an Arab country and those who seek a dominant role for the non-Moorish peoples. The discord between these two conflicting visions of Mauritanian society was evident during intercommunal violence that broke out in April 1989 (the "1989 Events"), but has since subsided. The tension between these two visions remains a feature of the political dialogue. A significant number from both groups, however, seek a more diverse, pluralistic society. Politics in Mauritania have always been determined by personalities and tribes more than ideologies, with any leader's ability to exercise political power dependent upon control over resources; perceived ability and integrity; and tribal, ethnic, family, and personal considerations. Conflict between white Moor, black Moor, and non-Moor ethnic groups (Haal Pulaars, Soninkes, Wolofs and Bambaras), centering on language, land tenure, and other issues, continues to be the dominant challenge to national unity. The government bureaucracy is composed of traditional ministries, special agencies, and parastatal companies. The Ministry of Interior spearheads a system of regional governors and prefects modeled on the French system of local administration. Under this system, Mauritania is divided into 13 regions ( wilaya), including the capital district, Nouakchott. Control is tightly concentrated in the executive branch of the central government, but a series of national and municipal elections since 1992 have produced some limited decentralization. Mauritania, along with Morocco, illegally annexed the territory of Western Sahara in 1976, with Mauritania taking the lower one-third. After several military losses to Polisario, Mauritania retreated in 1979, and its claims were taken over by Morocco. 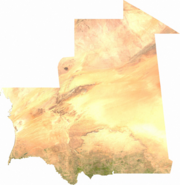 Due to economic weakness, Mauritania has been a negligible player in the territorial dispute, with its official position being that it wishes for an expedient solution that is mutually agreeable to all parties. After independence, President Moktar Ould Daddah, originally installed by the French, formalized Mauritania into a one-party state in 1964 with a new constitution, which set up an authoritarian presidential regime. Daddah's own Parti du Peuple Mauritanien (PPM) became the ruling organization. The President justified this decision on the grounds that he considered Mauritania unready for western-style multi-party democracy. Under this one-party constitution, Daddah was reelected in uncontested elections in 1966, 1971 and 1976. Daddah was ousted in a bloodless coup on July 10, 1978. The Parti Républicain Démocratique et Social (PRDS), formerly led by President Maaouya Ould Sid'Ahmed Taya, dominated Mauritanian politics following the country's first multi-party elections in April 1992 following the approval by referendum of the current constitution in July 1991. President Taya, who won elections in 1992 and 1997, first became chief of state through a December 12, 1984 bloodless coup which made him chairman of the committee of military officers that governed Mauritania from July 1978 to April 1992. Political parties, illegal during the military period, were legalized again in 1991. By April 1992, as civilian rule returned, 16 major political parties had been recognized; 12 major political parties were active in 2004. Most opposition parties boycotted the first legislative election in 1992, and for nearly a decade the parliament was dominated by the PRDS. The opposition participated in municipal elections in January-February 1994 and subsequent Senate elections, most recently in April 2004, gained representation at the local level as well as three seats in the Senate. Mauritania's presidential election, its third since adopting the democratic process in 1992, took place on November 7, 2003. Six candidates, including Mauritania's first female and first Haratine (former slave family) candidates, represented a wide variety of political goals and backgrounds. Incumbent President Maaouya Ould Sid'Ahmed Taya won reelection with 67.02% of the popular vote, according to the official figures, with Mohamed Khouna Ould Haidalla finishing second. Sid'Ahmed Taya recognized Israel (see Foreign relations of Mauritania), which made Mauritania the only Arab country not neighbouring Israel which recognized the latter (Morocco and Qatar have official ties with Israel, but do not fully recognize it). He also started cooperating with the United States in antiterrorism activities, which was criticized by human rights NGOs, who talked of an exaggeration and instrumentation of alleged terrorist activities for geopolitical aims. A group of current and former Army officers launched a bloody but unsuccessful coup attempt on June 8, 2003. The leaders of the attempted coup were never caught. Applauded by the Mauritanian people, but cautiously watched by the international community, the coup has since been generally accepted, while the military junta has promised to organize elections within two years. In a referendum on June 26, 2006, Mauritanians overwhelmingly (97%) approved a new constitution which limited the duration of a president's stay in office. The leader of the junta, Col. Vall, promised to abide by the referendum and relinquish power peacefully. Discovered in 2001, Chinguetti has proven reserves of about 120 million barrels of oil. At the end of December 2005, authorities estimated that in 2006, the oil profits would be 47 billion ouguiyas (about US$180 million) and represent a quarter of the state budget, according to RFI . The Australian Federal Police are currently investigating Woodside for allegations of bribery and corruption in Mauritania (according to the Sydney Morning Herald ). Mauritania is divided into 12 regions (régions) and 1 capital district, and subdivided into 44 departments (départements). At 397,929 mi² (1,030,700 km² ), Mauritania is the world's 29th-largest country (after Bolivia). It is comparable in size to Egypt. Mauritania is generally flat, its 1,030,700 square kilometers (397,850 sq mi) forming vast, arid plains broken by occasional ridges and clifflike outcroppings. A series of scarps face southwest, longitudinally bisecting these plains in the centre of the country. The scarps also separate a series of sandstone plateaus, the highest of which is the Adrar Plateau, reaching an elevation of 500 meters (1,640 ft). Spring-fed oases lie at the foot of some of the scarps. Isolated peaks, often rich in minerals, rise above the plateaus; the smaller peaks are called guelbs and the larger ones kedias. The concentric Guelb er Richat (also known as the Richat Structure) is a prominent feature of the north-central region. Kediet Ijill, near the city of Zouîrât, has an elevation of 1,000 meters (3,280 ft) and is the highest peak. Mauritania and Madagascar are the only two countries in the world not to use decimal-based currency. The basic unit of currency, the ouguiya, is comprised of five khoums.